Dessert just may be the favorite part of a meal for many people. 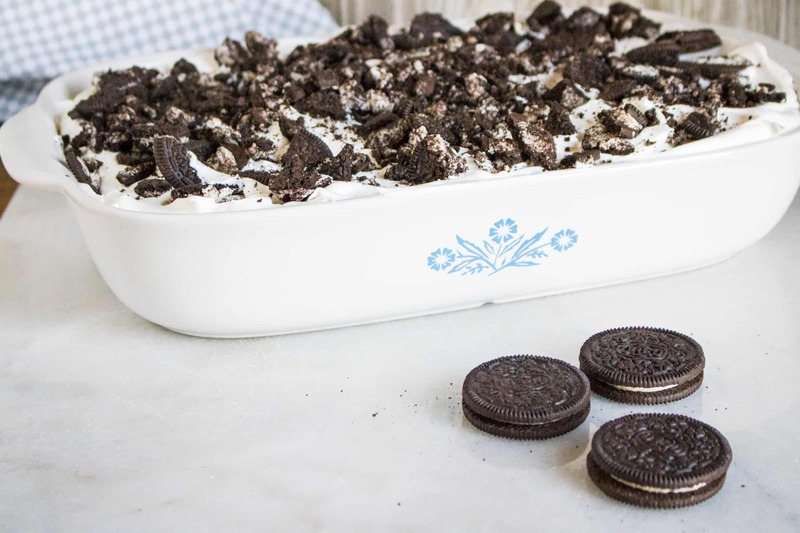 Put this Oreo Poke Cake on your menu, and everyone will happily skip the entrée altogether and head straight to dessert. 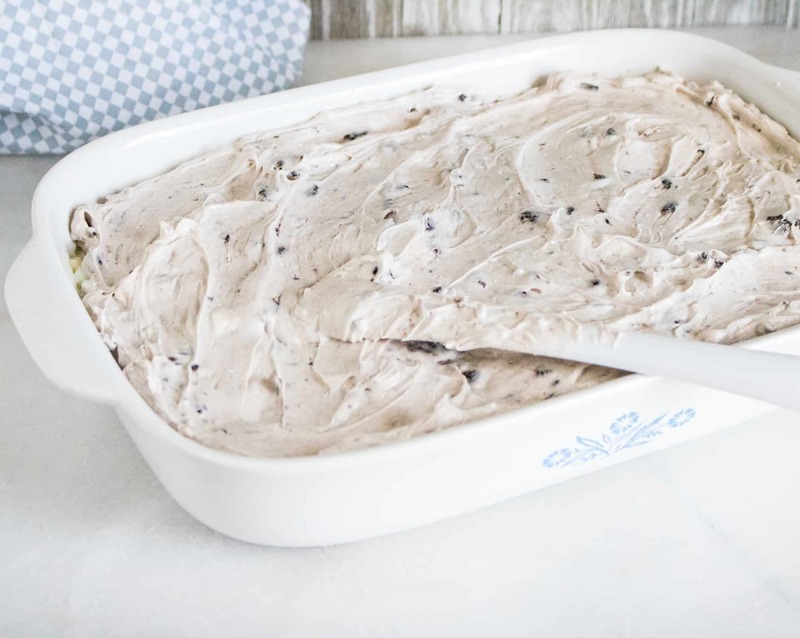 Not only is Oreo Poke Cake delicious, it is like having 2 favorite desserts in one! 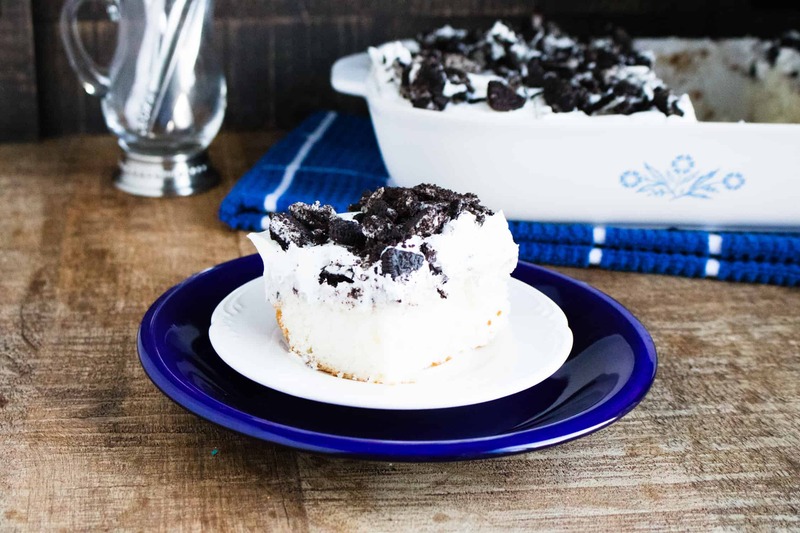 It perfectly marries Oreo cookies together with a moist, fluffy, pudding-filled white cake that is frosted with cream cheese frosting, and then topped with whipped topping. This dessert doesn’t know when to quit! Poke Cake was invented in 1969 by General Foods Corporation, as a way to increase sales of their flagship product, Jell-O. Their original poke cake is made by baking a white sheet cake, poking holes with a fork all over the top of the cake, and then pouring strawberry Jell-O all over the top of the cake, allowing it to fill the ‘poked’ holes. But, bakers are now moving beyond gelatin and filling their poke cakes with everything from flavored syrups, chocolate, and salted caramel, to fruit purées, puddings, and even boozy cocktail mixes. It is has a little something for everyone. Oreos for the cookie and the chocolate lover. 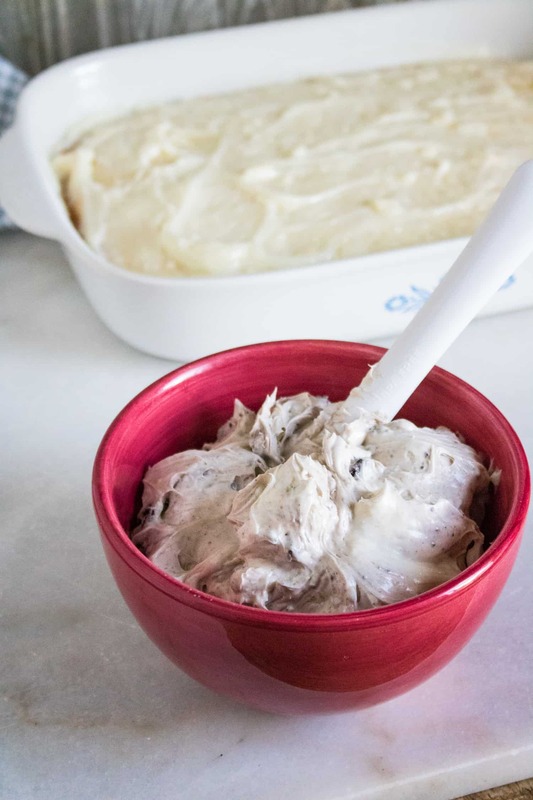 Cream cheese frosting for the person who loves the taste of cheesecake. And fluffy whipped topping to make it pretty and to balance the chocolate. Because, as is typical of poke cakes, it is super moist! The white chocolate pudding filling in all of the poked holes makes each bite deliciously moist. Since it has to chill for 4 hours, it is a great cake for the warm weather months! It is almost like an amped-up ice cream cake. Cool and so amazingly tasty. 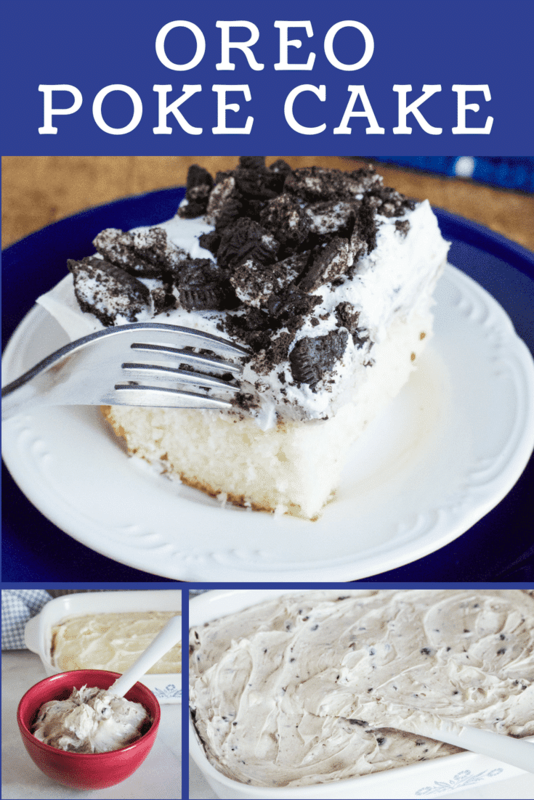 If you like this Oreo Poke Cake recipe, take a look at these other yummy dessert options. You’ll be sure to find one you simply can’t wait to try! Looking for a heavier dose of chocolate? And/or need something gluten-free? Try the Gluten Free Flourless Chocolate Cake. It’s sure to satisfy that chocolate craving. Since it’s summer and there are so many delicious fruits in season, perhaps you’re more in the mood for fruitier dessert. These Blueberry Lemon Bars are delicious and taste like sunshine. Or, maybe you love the idea of a poke cake and want to enjoy something with a fruit flavor. We have a recipe for that, too. Try the Apple Spice Poke Cake. Step #2: Combine pudding mix with milk. Step #3: Add pudding mixture to cake. An easy way to do this is to use a large candy decorating bottle to squeeze the pudding mixture directly into the holes in the cake. Step #4: With a handheld mixer, cream together the cream cheese and powdered sugar. Add in the milk and mix until smooth. Step #5: Crush 6 Oreo cookies and add to the cheesecake mixture. Step #6: Spread the cheesecake mixture over the top of the cake. Step #7: Spread whipped topping over the cheesecake layer, and then crush up the remaining Oreo cookies and sprinkle them over the top of the cake. Step #8: Chill for 4 hours before serving. Step #9: Serve and enjoy!! 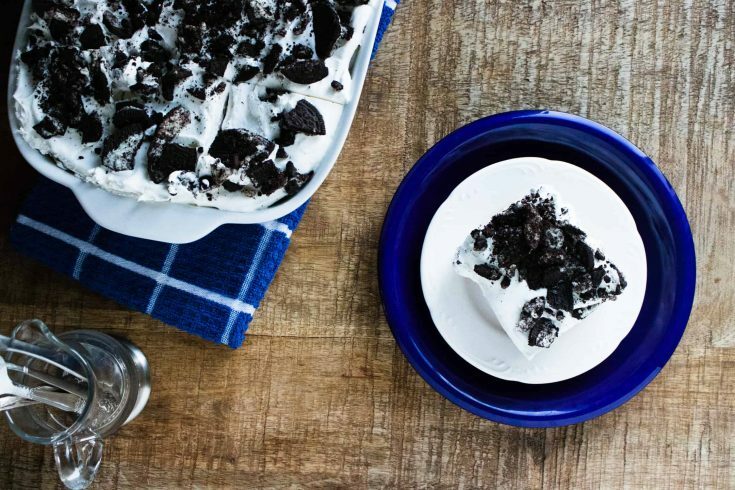 Oreo Poke Cake is moist, creamy and delicious. Plus it's like having 2 of your favorite desserts in one! Add pudding mixture to cake. An easy way to do this is to use a large candy decorating bottle to squeeze the pudding mixture directly into the holes in the cake. With a handheld mixer, cream together the cream cheese and powdered sugar. Add in the milk and mix until smooth. Crush 6 Oreo cookies and add to the cheesecake mixture. Spread the cheesecake mixture over the top of the cake. 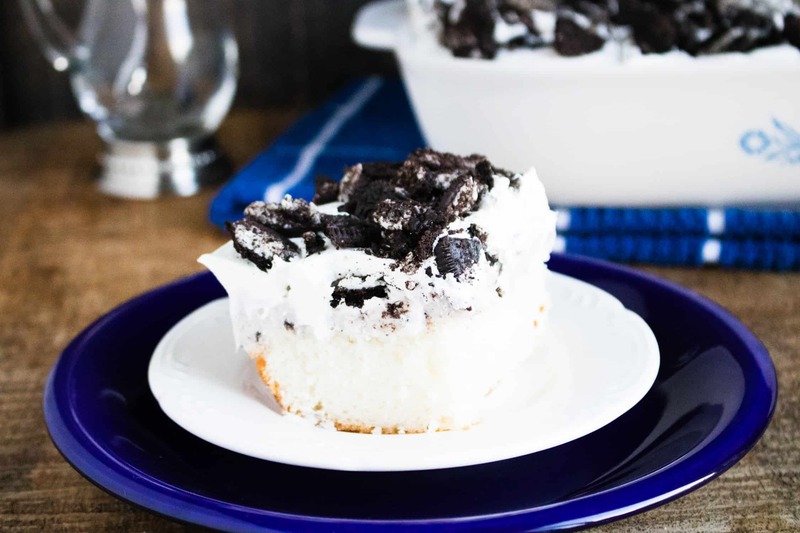 Spread whipped topping over the cheesecake layer, and then crush up the remaining Oreo cookies and sprinkle them over the top of the cake.